Bamboo 5.7 has been released! 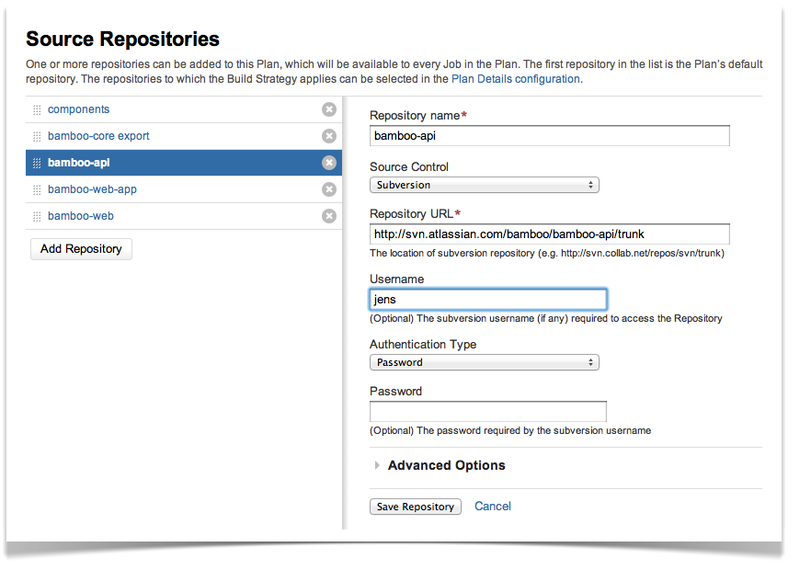 See the new features in the Bamboo 5.7 release notes and read the Bamboo upgrade guide. Atlassian is proud to present Bamboo 3.3 with support for Multiple Repositories, Reload-able Plugins, multiple source aliases and many more improvements. Upgrading to Bamboo 3.3 is free for all customers with active Bamboo software maintenance. Your votes and issues help us keep improving our products, and are much appreciated. Please keep logging your votes and issues. They help us decide what needs doing! 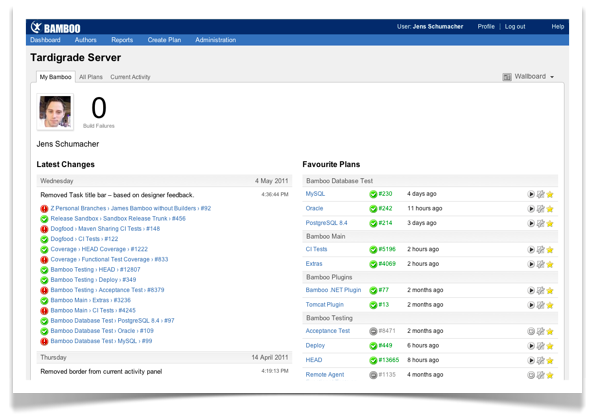 You can download Bamboo from the Atlassian website. If upgrading from a previous version, please read the Bamboo 3.3 Upgrade Guide. With Bamboo 3.3 you can now monitor and checkout code from multiple repositories. Easily build large projects, which are often composed of smaller, self-contained modules, without using externals or submodules. The new repository configuration interface makes it easy to administrate multiple repositories and specify which of the selected repositories should trigger the build. Reloadable Plugins make it faster and easier than ever to install or update plugins in Bamboo. Bamboo's most common module types now support Atlassians Plugin Framework 2, which allows for installing and updating plugins without restarting your Bamboo server. Install new Tasks on the fly without interrupting your builds. And for Tasks that are hugely complex and incompatible with earlier versions, Bamboo now offers a way to safely pause your server without breaking running builds. To ensure all code changes across different repositories are attributed to the right person, Bamboo 3.3 now supports multiple user aliases. If your username is "clarkkent" in one repository, and "superman" in another one, you can map both aliases to the same user in Bamboo. That's not only handy in the DVCS world, but will also be useful for Plans with multiple source repositories. To make sure the statistics are still accurate, we have also aggregated the author statistics into a user statistic. Upgrading your agents manually for a new Bamboo release can be painful, especially if you have dozens of agents. With Bamboo 3.3 you no longer have to worry about your agent upgrades, Bamboo will upgrade your agents automatically. We have also massively improved the performance with which new Plugins and Classes are transferred to the agent. 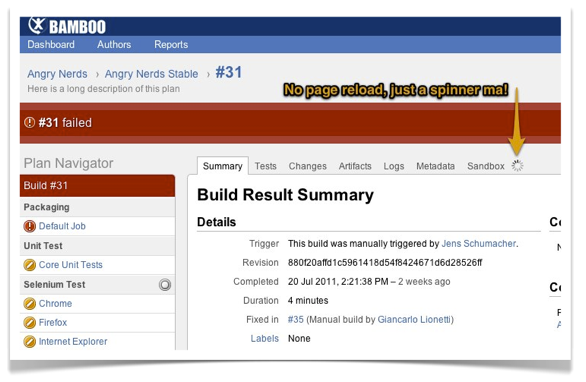 Bamboo 3.3 now shows you all the important information about your build even faster. By loading tabbed content via AJAX (instead of full-page reloads) we significantly decreased the page-load times when browsing build results. Utilizing HTML5's browser history API we keep track of which tabs (and their URLs) you had selected, so your back/forward buttons work as expected. It's great to know what builds are broken, but for a developer it's even more important to know whether his recent commit was the cause. Bamboo 3.3 now provides a commit centric view in Bamboo, showing builds in relation to an individual commit and providing a way to assess a level of overall confidence in a commit. The "My Bamboo" page now has been completely revamped and is not only a whole lot more useful, but also a whole lot prettier. The top 10 issues by votes are shown below. For the full list of fixes and improvements, please refer to our public JIRA site to see a full list of issues fixed in this release of Bamboo.